An interactive dinner mystery show open to the public. The cosmetic world has never been the same since Terry Fay began her multi-million dollar cosmetic company. Some call her the “Queen of Cosmetics,” and she is ready to crown a new Grand Exalted Omnipotent Superior Leader. Though the position is far below that of Terry Fay herself, it’s so important that one Terry Fay girl is dying to win. Dinner & Show – ONLY $33.50! Performance starts at 8 pm. Price does not include tax/gratuity. Come see me play Bambi Kulakowski: a wide-eyed, feather-brained, cosmetic pusher who believes everyone is (or with a little help, can be) beautiful. This relentless heat and drought certainly contribute to my current crankiness. I have summer seasonal affective disorder. The sky may be blue, but spend a few minutes baking in my yard (a.k.a. the dustbowl). You'll understand why I'm moving at sloth speed and why any activity requiring me to leave the air-conditioning gives me a headache. Stupid, bright, shiny, hot heat. Stupid drought. My birthday is October 8. I want gravel for my birthday --lots and lots of gravel to cover this corner lot of dusty dirt that surrounds our otherwise cute house. Maybe some cacti would be good too, because Austin is turning into a desert. May as well embrace the aesthetic (or lack thereof). After a trial separation, the blog and I have decided that we just can't live without each other. We've patched things up. We're getting back together. I mostly blame myself for the separation. I think I just needed a little alone-time. Absence made my heart grow fonder. I realized how much I missed the blog. Fox Services installed a brand new energy efficient air conditioner/furnace after the old, very loud electricity-sucker conked out. The new HVAC system was expensive, like trip to Europe for two expensive, but very much worth it as we now enjoy a steady, quiet 78 degrees inside and a 30% lower utility bill. 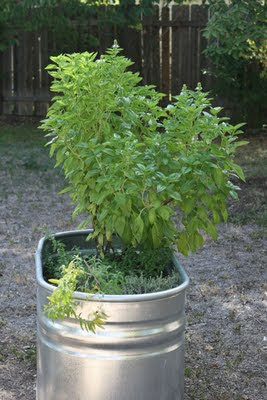 We got a few rebate checks and will also get some kind of income tax credit for upgrading to an energy efficient model. After completing a challenging acting class that ended with a talent showcase for casting directors and talent agents, I finally signed with a talent agent! Condra Artista represents me in San Antonio and Austin. I've been on two auditions already. Sadly, there aren't many film projects happening in the area lately. Thank goodness Friday Night Lights, the television show, will begin filming the fourth season here in September. Central Texas had the hottest month on record in July. We're also in the midst of the worst drought since the 1950s. 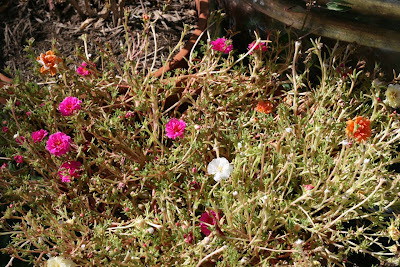 Gardening and landscaping at the 1952 House have come to a standstill, except for a bumper crop of basil and these succulent flowers. Chad and his business partners signed a lease on a small office for their new business. The office is an old house that was rezoned for commercial space. Chad's new commute clocks in at just under two miles. I'm so proud of Chad and his partners. These guys have exceeded my expectations by far! As a result of Chad's new office space, I don't have to share my desk anymore, but also don't find iced lattes waiting for me in the refrigerator. Chad and I escaped to Estes Park, Colorado for a few days of cooler weather, a friend's lovely wedding reception and Rocky Mountains scenery. We stayed at the one-hundred-year-old Stanley Hotel. This lovely old hotel is reportedly haunted. Stephen King stayed at The Stanley Hotel and was inspired to write his bestselling book, The Shining after a few ghostly encounters there. Chad and I didn't see any ghosts, but the last morning we were there, someone gently shook my shoulder to wake me. I opened my eyes to see Chad fast asleep on the opposite side of our king-size bed. Our hotel room was locked up tight. I was just a touch scared, and slightly annoyed to get my ghostly wake-up call an hour and a half before I needed to be awake. I took another fun sewing class at Stitch Lab, which is owned by my long-time friend and former Zach Scott Theatre coworker, Leslie Bonnell. 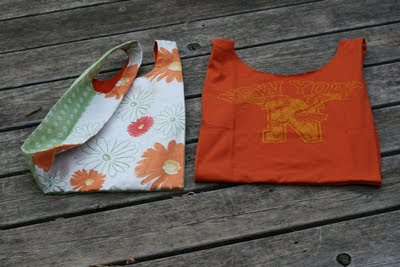 I learned to make reusable grocery bags out of fabric remnants and old t-shirts. Gravel. I'm done with trying to keep grass alive here. New paint colors on the exterior trim of the house. Public shows with my mystery dinner theater group at The Spaghetti Warehouse.